After 12 years of living in the middle of major construction projects, Tony McDonnell just wants a quiet life. Mayor Street Upper in the north Docklands, which was once a quiet cul-de-sac, is now a noisy thoroughfare. The Luas rings its bell from 5:30am each weekday, until 1am the next day. And several major construction projects are taking place close to McDonnell’s home. Dublin City Council has granted permission for builders to work through the night until 4am, two days a week on one of the sites. “So, on those nights we will have around an hour and a half of quiet,” McDonnell says, between construction ending and the dreaded bell of the Luas. A construction site near Manor Street Upper. As part of the planning process An Bord Pleanála sets down the hours when developers can carry out construction works. In the North Lotts & Grand Canal Dock SDZ Planning Scheme, which includes McDonnell’s street, construction is approved to take place 7am to 6pm on weekdays, and 8am to 2pm on Saturdays. But Dublin City Council can grant waivers, also known as “derogations”, which allow the developer to work on the site outside of those hours. These extensions to building hours are supposed to be granted only in “exceptional circumstances”. Fianna Fáil Councillor David Costello has looked for a definition of “exceptional circumstances” from council officials. He hasn’t been given one. If developers intend to work throughout the night, they should raise it with An Bord Pleanala during the planning process, says Costelloe. “If they are planning to do it that way from the start, then it is not exceptional circumstances,” he says. Other councillors question the way the process for granting waivers works: planners decide, and there’s no means for residents to weigh in. The derogations “amount to a breach of natural justice”, said Green Party Councillor Ciarán Cuffe. He says McDonnell “is losing out on the peaceful enjoyment of his home and family life, which is a basic right”. On 6 February, Dublin city councillors passed a motion asking Dublin City Council Chief Executive Owen Keegan to make more of an effort to protect Docklands residents from the noise, particularly late at night and over weekends. The council is exploring ideas for measures that developers could put in place to protect residents during extended working hours, says a Dublin City Council spokesperson. Once concrete is poured it has to settle and then be power-floated, a cycle that takes about 18 hours, according to a report submitted by building contractor Walls to Dublin City Council to explain its concrete-pouring process. McDonnell is not satisfied with this explanation, though. As vice-chair of the North Port Dwellers Association, he attended the planning process meetings at An Bord Pleanála. Six sites in the Docklands currently have waivers to operate beyond normal working hours, according to a spokesperson for Dublin City Council. Dublin-wide figures weren’t available before publication. McDonnell says he and his neighbours on Manor Street Upper and New Wapping Street used to have privacy and tranquility. It is difficult to imagine. The Luas runs right outside his door. Two diggers rumble loudly in the construction project directly opposite his house. Across the tracks, some 10 metres from his house, a 169-bedroom hotel is going up on North Wall Quay. McDonnell says he and his wife have abandoned their master bedroom to move to a smaller room at the back of the house. “But what are we going to do when they start building out there?” he asks, pointing to his back garden. Area residents are looking at another 10 years or so of construction, says McDonnell. Planning permission has been granted for further development all around them. There are plans for an eight-story residential unit with 215 apartments behind the house. To the east, there will be 105 apartments in 5 blocks. And the fact that construction is allowed at night makes it all worse, McDonnell says. “Why did no one protect us?” he asks. Having suffered years of broken sleep during Luas construction works, the community in North Port was ready when it came to the current round of construction, says McDonnell. Along with other local residents, he attended all the planning meetings with An Bord Pleanála and made detailed submissions. He was satisfied that the working hours agreed were reasonable. It’s not just in the northern Docklands that residents complain of major construction taking place late into the night and early morning. 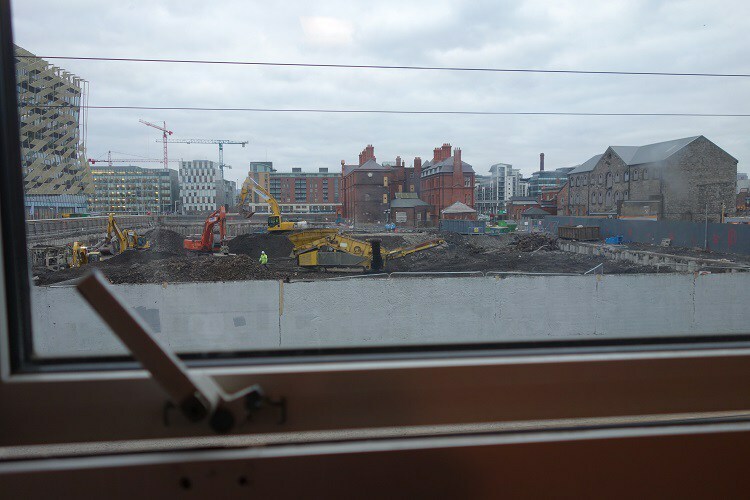 At Pearse House on the other side of the river, Paul Robinson says that residents – especially those on night shifts – are struggling with construction on the site opposite. And on South Circular Road near St James’s Hospital, Mary Carney says she can hear work on the new children’s hospital from her home. Construction there has been restricted to Monday to Friday from 7am to 7pm, and Saturday from 8am to 2pm, according to the planning application. But Carney says that gas and electricity works are being done at the weekends, meaning there is noise seven days a week from the site. “What is our council doing on our behalf? We are their tax payers. They keep talking about encouraging family life in the city, but actually they don’t,” says Carney. “These are the things that would cause people to turn around ultimately and go, ‘This isn’t the city that we want to live in after all,’” she says. Laoise Neylon is a regular contributor to Dublin Inquirer. Want to share a comment, tip, or story? You can reach her at lneylon@dublininquirer.com.